Originally published in issue 29 of UPPERCASE Magazine, this brief history was based on interviews with several collectors and historical research as well as photographs of a local collection. This brief history of bookmarks is a translation of the originally Dutch text which had been published in 2007 as part of a special issue (devoted to bookmarks) of an obscure periodical with the title Vorm, Filosofie & Gaga Tijdschrift, XXste aflevering (125 copies only) by the Gand University Library, Belgium. The function of a sophisticated bookmark dating from the 13th (or up to the 14th) century is explained by Erik Kwaddel who is an assistant professor at Leiden University, The Netherlands, and specializes in medieval manuscripts, palaeography (study of ancient writing forms), and codicology (study of manuscripts). 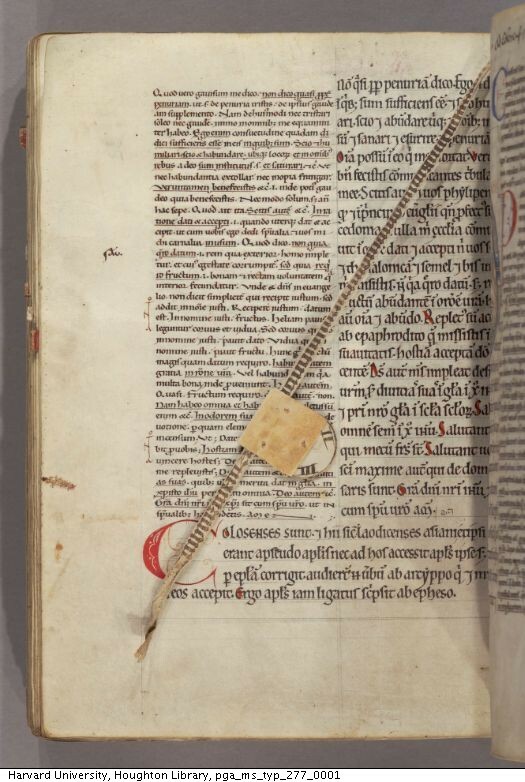 He also writes a highly recommendable blog about medieval manuscripts (medieval books.nl) where he presents among others also interesting forms of bookmarks found in such manuscripts. Despite their attraction, medieval bookmarks are often left unmentioned in special collections catalogues. When talking about manuscripts with the uninitiated, I usually mention how features that guide us through our modern books - running titles, subheadings, and indices, for example - originated in the Middle Ages. Yet, I tend to overlook bookmarks (despite my childhood collection of them) as a sort of 'separate apparatus'. Bookmarks, however, also have an interesting medieval past. Removable register bookmark in Exeter Cathedral, MS 3515, 13th century. This article which has been republished online on The World of Bookmarks (Mirage Bookmark website) as an abridged form of the original gives references to the original illustrations of the printed paper and additional images has been inserted to illustrate the text. The article has been published on the website of The American Ephemera Society in 2011 and gives a brief overview on bookmarks including the history and various types of bookmarks and a short bibliography. ​A detailed article about the 19th century bookmarks handcrafted by stitching on perforated card templates approximately between 1820s and 1900. Published on the website of the Victoriana Magazine. This short survey of the Victorian woven silk bookmarks produced by Thomas Stevens from Coventry, UK, has been published online in The World of Bookmarks (Mirage Bookmark website). A short article on antique bookmarks presented by the website Collectors Weekly, a resource for people who love vintage and antiques. 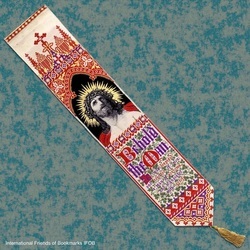 The article is accompanied by a picture gallery of ancient bookmarks from auctions. This is a series of short articles and interviews about the wonders of collecting that ever-so-important companion of readers everywhere: the bookmark! They have been written by the editor Lindy Gamolo on the website of bookbed, a community for book sharing and storytelling. 'Knocking on Wood' presents wooden bookmarks from all over the world, and 'Film-featuring Bookmark Series by Libreria Follas Novas' tells about the beautiful bookmarks decorated with posters of film classics. Worth to have a look. This is one of the most frequently asked questions by bookmark collectors. Several collectors describe their methods on this online page of The World of Bookmarks (Mirage Bookmark website). 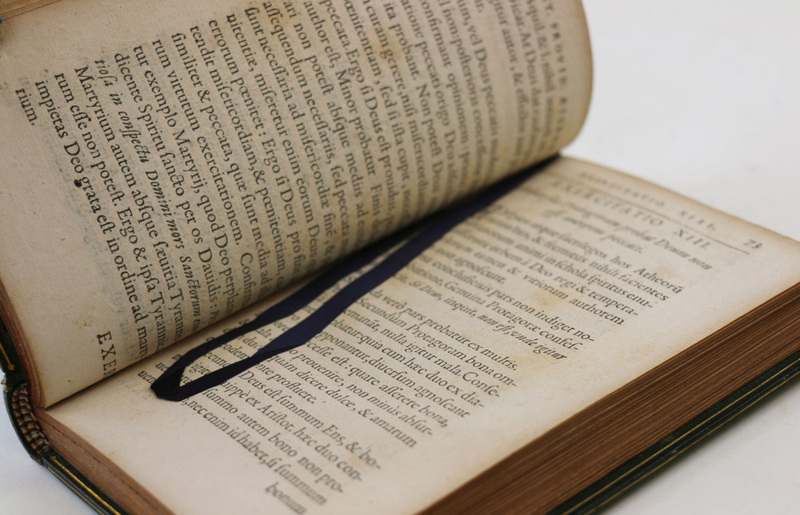 As dealers specializing in old books, the authors have a special view about the bookmarks and how detrimental they can be for the books. 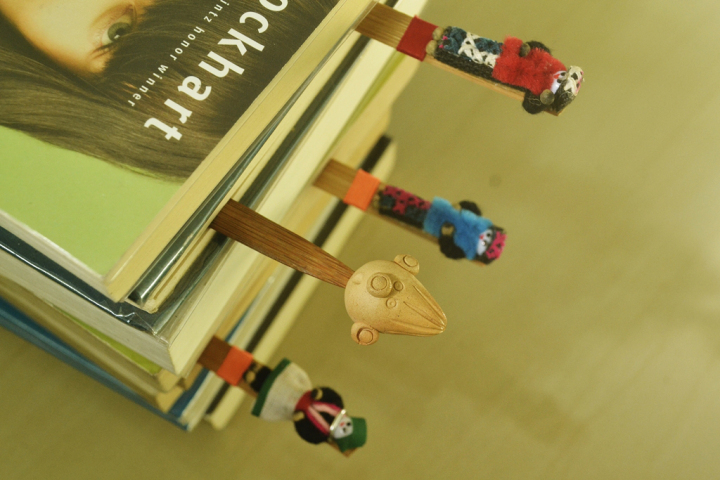 They illuminate the various aspects of collecting bookmarks for book collectors. 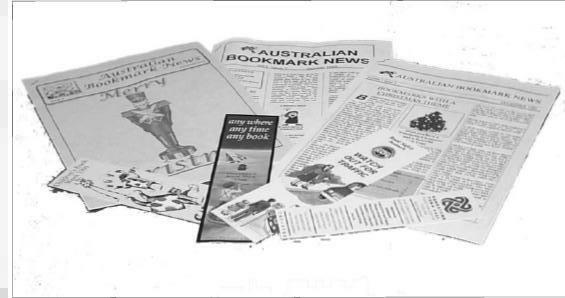 Jurgen Wegener from The Book Collectors' Society of Australia discusses the present, past and the future of bookmarks in a detailed article putting up interesting questions he would like to get some answers for. Read more here. 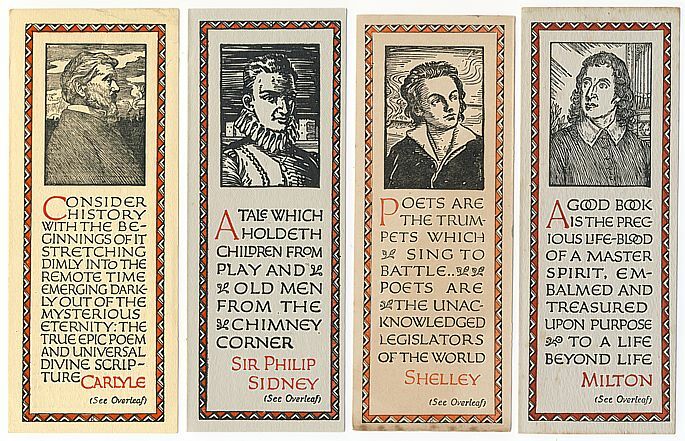 Everyman's Library is a series of reprinted classic literature published by J.M. Dent & Co. in London from 1906 on. The company issued several series of bookmarks to advertise their books and encyclo-pedia. The series of books are popular collectors' items meanwhile and they are still in production, though as paperbacks only (Random House). A website for the collectors of Everyman's Library books features also a page about the bookmarks advertising the series. IFOB member and Australian collector Debrah Gai Lewis describes her collecting interests and the various ways she showcases them. When I mention that I collect bookmarks, some people rise from their seats and offer me their chair. They don’t ask if I’m crazy but the look in their eyes says it all, “Poor guy, I wonder what happened to him in his childhood?” Robin from Melbourne, Australia, tells about his experiences with collecting bookmarks on the bookbed website. When you think that your collection is full and you have so many bookmarks that nothing can surprise you, you will still find new amazing ones opening another wonderful land both for your collection and personality. Liudmila tells about her blog and her passion of collecting bookmarks in this interview. Frank Divendal from Alkmaar, The Netherlands, has been collecting bookmarks since 1982 and is publisher of various papers on bookmarks. He has established a new world record as the owner of the largest collection of bookmarks with 71'235 different examples back in 2007 and was listed in the The Guinness Book of World Records. In 2010, Frank had already 103'009 bookmarks in his collection according to the new record listed on the GBWR. The article is based on an interview with Frank and has been posted to the Mirage Bookmark website in April 2012. Read about the future prospects of libraries, and indirectly of bookshops and bookmarks. You wish to make a suggestion to add new content to our Reading Room? Contact us, we'll be pleased to hear from you.